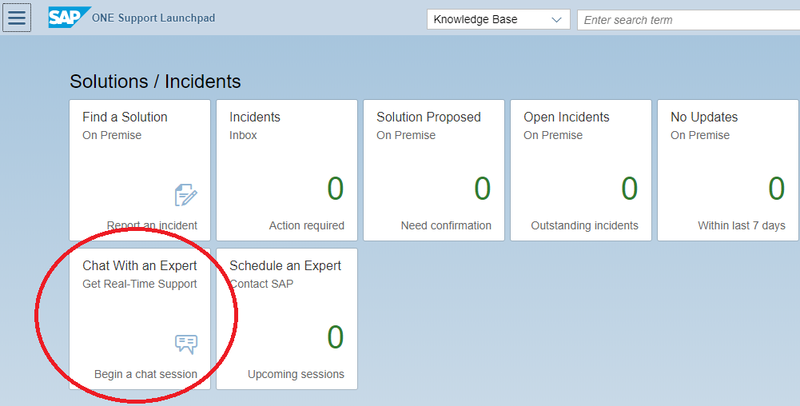 SAP on IBM i – Got a quick question? Try the Expert Chat! If you don’t see the icon Chat With an Expert on your launchpad, you may have to click on the Personalize button in the upper left corner and add the icon from the Miscellaneous section to your launchpad. Alternatively, you can go to https://support.sap.com and select Report an Incident. You will then see Expert Chat on the bottom left half of the screen. After you click on the icon Chat With an Expert, you must select the area of expertise. To ask a question about SAP on IBM i or Db2 for i, you can select the Expert Area SAP Netweaver Databases & Operating Systems and then IBM DB2 for iSeries (AS/400). 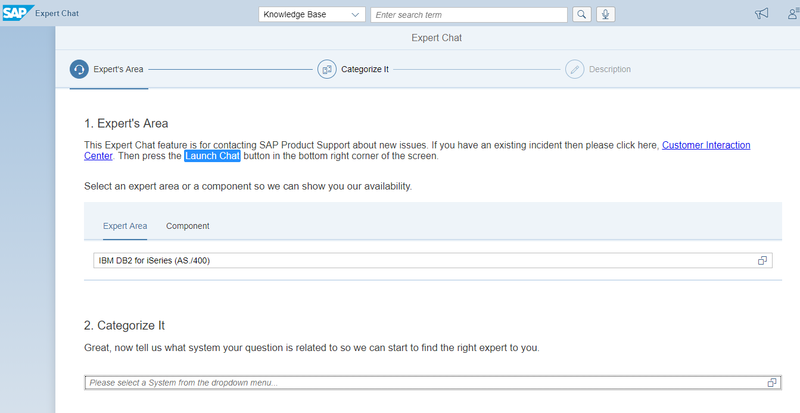 Alternatively you can select the tab Component and then start typing the SAP support component that is most likely associated with your question, e.g. BC-OP-AS4, BC-DB-DB4, BC-INS-AS4 or BW-SYS-DB-DB4. At the end, you need to push the button Start Chat at the bottom of the screen. Based on availability, you may now have to wait a few seconds until an expert is available to chat with you try to answer your question. Please note that you will chat with a real person, not with a chat bot. 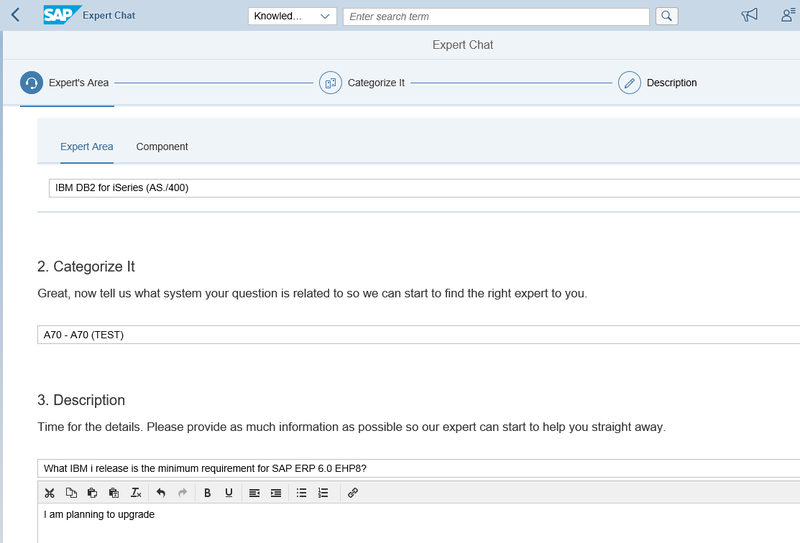 If your question turns out to require a more in-depth analysis, the SAP support will turn the chat transcript into an SAP incident, so that no information from the chat is lost and the SAP support can continue to work on your problem through a regular SAP incident. Don’t hesitate to give it a try next time you are having a question for SAP on IBM i or any other area of SAP. thank you for your comment. We are sorry that your first experience with the Expert Chat was poor. As I stated in my blog post, the Expert Chat is handled by real people, not an automated chat bot. SAP is trying their best to cover all time zones around the world with experts being located in Ireland, the USA and China. However, it is still possible at a certain point in time that none of the experts is online, or that all available experts are busy with critical customer issues. In your case, the holiday season may have played a role, too. I would hope that you will try the Expert Chat in the future again, and that your experience will be better next time.